The seventh installment in the immensely popular space opera film series; and the first chapter in over ten years. It takes place 30 years after the events of 'RETURN OF THE JEDI'; when the Galactic Empire has now become 'The First Order', and the rebel alliance has now become the 'Resistance'. The story deals with a First Order stormtrooper, named Finn, who's looking for redemption; after gaining possession of a map, to Luke Skywaler's whereabouts. The film was directed by J.J. Abrams; and it was written by Abrams, Michael Arndt and Lawrence Kasdan (who also co-wrote 'THE EMPIRE STRIKES BACK' and 'RETURN OF THE JEDI'). Harrison Ford, Mark Hamill, Carrie Fisher, Peter Mayhew, Anthony Daniels and Kenny Baker all reprise their roles, from the original trilogy; and they're joined by newcomers Daisy Ridley, John Boyega, Adam Driver and Oscar Isaac. The series creator, George Lucas, returned as a creative consultant; and John Williams once again scored the music (as he did all six previous chapters, in the franchise). I think it's the most entertaining movie, I've seen, in 35 years! We first learn that Luke Skywalker (Hamill) has gone missing; and due to his absence, the ruthless First Order has gained power, and control, over the galaxy. Princess Leia Organa (Fisher) is now a general, of the Resistance, and she believes finding Luke is humanity's only hope. She sends her best X-wing fighter pilot, named Poe Dameron (Isaac), to the desert planet of Jakku; in order to locate a map, which can lead to her brother's whereabouts. On his mission Poe meets a stormtrooper, looking for redemption, named Finn (Boyega). Finn joins Poe in his adventure; he also later teams up with a scavenger, named Rey (Ridley), and a veteran war hero, named Han Solo (Ford). The film is definitely the best written, of the entire franchise; with clever, witty dialogue (for the first time, in the series). It also has the most humanity, and thoughtful drama (I cried multiple times). It's surreal seeing Han, Luke, Leia, Chewbacca, and other original cast members, on the big screen again (in a new movie); and I think it was justifiable asking Fisher and Hamill to lose weight, for their parts (it's necessary to the roles they're playing). The new characters are also extremely likable, and soon to be classic, as well. Ridley is a revelation, and I think she rivals Jennifer Lawrence; for one of the best performances of the year! 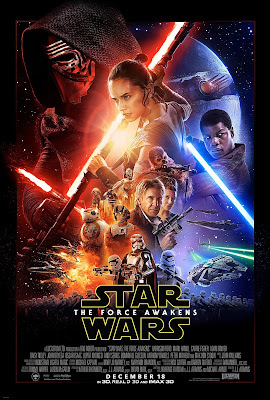 Driver, Boyega and Isaac are all fantastic as well; and Ford is, once again, classic! The movie (without question) deserves several Oscar nominations; for Best Picture, Best Director, Best Original Screenplay, acting and more. The approach Abrams takes, to the material, is exactly right (it's traditional, old fashioned filmmaking). The film is everything you could possibly expect (or want) from a 'STAR WARS' movie; it's funny, heartfelt, touching and action-packed. All of the best parts of the previous installments, with none of the cheese! It's at least the best in the series since 'THE EMPIRE STRIKES BACK'!